The blocks of embroidery are laidwork. It is a simple way to cover areas and is not a complicated stitch to master. It is also economic with thread and covers areas quickly compared with many other embroidery stitches. The importance of planning the direction of the laid threads cannot be over-stressed (See images 1.1 & 1.2). The best plan is to sort out the central figure and work out the directions of the laid threads towards surrounding objects. This is also a good time to think about the colours for the area being worked on. 1 The first step is to outline the area. This is done with the outline stitch. The advantage of marking the outline first is that the sketch that has been traced on the surface of the linen can easily be erased. This is particularly true for areas around the edge of a figure. There might be occasions when it might make sense to outline the laid work after. A situation where this might arise is where two sections of laid work meet. It might make a neater finish if the boundary is outlined after step 2 has been completed. 2 The base layer of laid work consists of parallel threads to fill the frame outlines in step one. A thicker wool is used for the laid work and the threads are close so that none of the linen is visible. The thread is taken up next to the place that it went down leaving just a small stitch at the back. There is a risk that the wool can be pulled too tight. The wool should not be under any tension. At this stage, the work is vulnerable to snagging. Try to avoid laying threads that will be more than about 10 cm as it is difficult to prevent the threads becoming tangled. 3 A couching thread in now laid across the laid threads at right angles. The couching threads are normally finer and the same colour as the laid threads they are covering. However, both the type and colour of the couching threads can be varied for effect. The stitches used when couching the laidwork need to be 2 – 5 mm apart. If the stitches are more than about 7mm apart, the laid threads fluff up. This could be used for effect in exceptional cases but looks messy in larger areas. The threads should not be in tension. 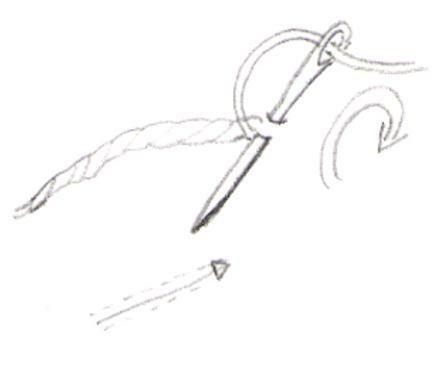 It is better to locate each couched thread, as described in step 4, with stab stitches. 4 The whole piece is secured with stab stitches. As mentioned above, experience suggests that it is best to fix each couching thread in turn. Once again, the fine wool of the same colour is selected. The couching thread is the one that is fastened through the linen and holds the bottom layer of laid work in place. The closer the couching threads and stab stitches, the more solid the feel of the finished image and the firmer the texture. Tension is again important. With the stab stitch, the thread goes down and up through the same hole. The thread is then passed along at the back to the next stab position. These threads can be under some tension. This is the only thread visible at the back of the embroidery. The end of threads are left with about 4 cm sticking out at the back. 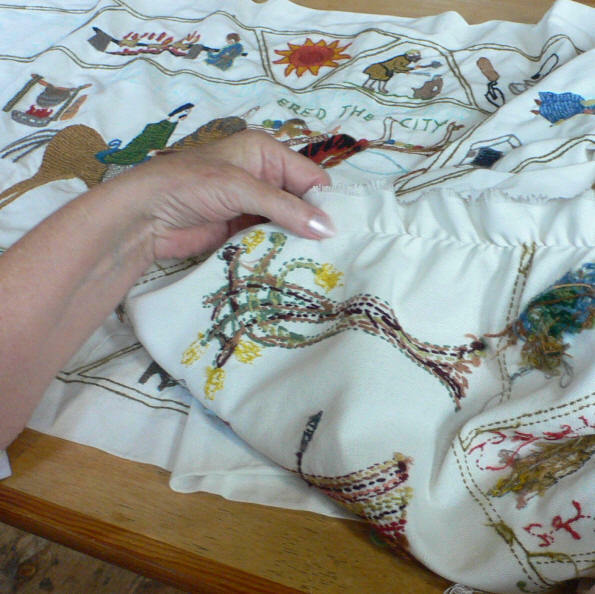 At the end of each session, the frame is turned and the threads are worked into the backing fabric. What does it look like from the back? 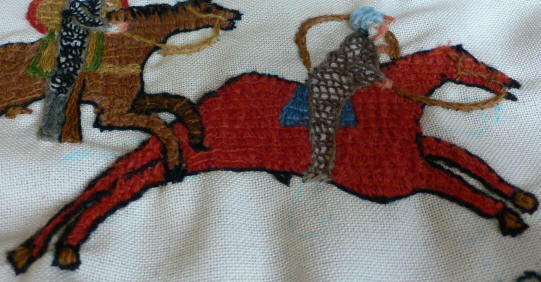 The image below illustrates what the tapestry looks like from the back. Clearly visible are the outline stitches. The only other threads shown are the stitches used to hold the laid wool in place. The source of this image is unknown. It is probably the work of one of the conservation teams who have worked on the Tapestry and as such is gratefully acknowledged. Part of the tapestry seen from the back. The stitches used when couching the laidwork need to be 2 – 5 mm apart. If the stitches are more than about 7mm apart, the laid threads fluff up. This could be used for effect in exceptional cases but looks messy in larger areas. The closer the tie-stitches, the more solid the feel of the finished image and the firmer the texture. You can also use the twist of the thread to add texture to clothing by, for example, producing something like a herringbone effect. Laying large areas can look very dull and lifeless. Where possible, change the direction of the laid threads within the area to reflect what it is representing. So the direction of the laid wool might vary when the leg of a horse meets the flank. It is very clear that most of the embroiderers put in the laid area first and then outlined it later. This is the way Jan Messent says she worked. This is not an inflexible rule. Stitching the outline after the laid threads does make for a neat edge but outlining first does give an edge to work to. If you prefer to outline and then fill, that is fine. You should adopt the approach to suit yourself and those you might be working with. 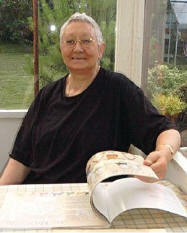 Jan Messent - who mentored the design. The direction of the laid thread can be used to great effect when working images of items of clothing, where the stitches can match the way the fabric would flow and fall and show where the an arm extends across the fabric. Laying large areas can look dull and lifeless. Where possible, change the direction of the laid threads within the area to reflect what it is representing. 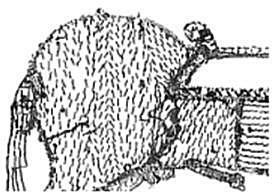 The direction of the laid wool might vary when the leg of a horse meets the flank or the arm crosses the body, even though they are to be worked in the same colour thread. The importance of planning the direction of the laid threads cannot be over-stressed. The best plan is to sort out the central figure and work out the directions of the laid threads towards surrounding objects. Figures - Bare flesh (hands, faces, legs and feet) outline only. The flesh is never filled with laid work. Horses – All hooves of one horse same colour. Horses don’t need to be realistic colours. The legs behind should be a different, possibly darker, shade or colour. Try to ‘introduce yourself’ to the character so you get to know them. The original embroiders knew a lot about some of the characters they were stitching. You might be able to incorporate the understanding from chapter three into your working. It is important that you know the context of the figure you are working: a ceremonial cloak might have bright colour but a warrior would wear darker colours, for example. The right half of panel three takes place at first light, etc. Straight lines are difficult to achieve and maintain on a flexible material such as cloth. The design has tried to avoid straight lines wherever possible. However, items such as spear shafts need to be as straight as possible. Complete as much of the surrounding embroidery first so that the stresses in the linen have been dealt with before adding any straight lines. The same applies to the wording, which will be added just before the panel is rolled on. Characters first – words come later. Tension needs to be carefully controlled to avoid distorting the underlying cloth. 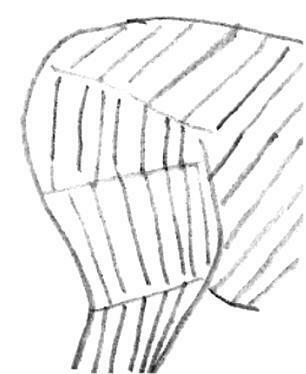 The fabric is flexible, so the line might have bent or moved. It is not impossible that the fabric will distort a little as it is embroidered and this might distort the tracing. 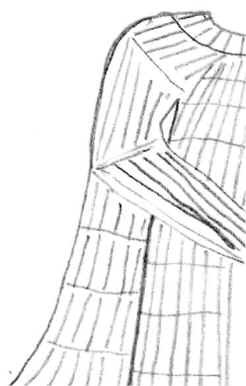 Please do not follow the traced lines if it is going to spoil the figure you are working. They might have been badly traced. You can mark a new outline of your figure and remake any lines that fade using one of the special pencils. Much of the charm of the original is in the differences rather than the uniformity. The design is there to be followed but you are encouraged to make adjustments and contributions. Faces are very important. The important people have details on their faces; the less important figures do not have much detail and are often seen in profile. It would be wise to experiment before doing a face as only a few threads are used to convey the impression of what the person is saying or thinking! This is the convention we are following – the faces are impressionistic so please do not try to be too naturalistic. Important faces also tend to be a little larger. That is another convention. The image needs to make sense on close inspection but also have an impact when viewed as a whole. To achieve this, the key figures or objects need to stand out in terms of colour, contrast and perspective. This shows the stages of laid work. The laid threads are quite vulnerable until the cross threads are stab-stitched to lock them in place. 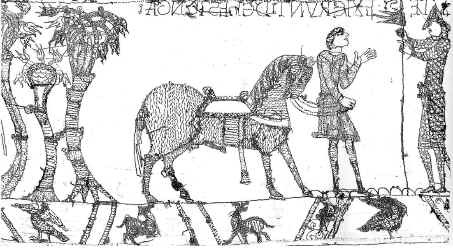 In the two centuries following the making of the Bayeux Tapestry, England became the centre of fine embroidery. Indeed, the style of work became known as opus anglicanum, or ‘English work’ and was exported all over Europe. The skill displayed by English workers in handling gold was particularly famous. Gold thread was silver wire covered in a layer of gilt. 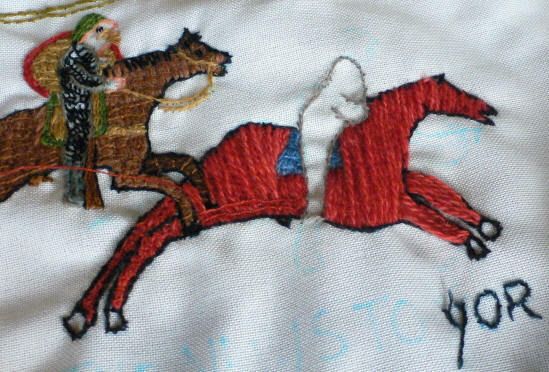 The technique of laying the threads used by the makers of the Bayeux has survived for gold work while later embroiderers tend to use a wider range of stitches. Indeed laid work stitches are only discussed in about half of modern books on embroidery. Laid stitching is economic with the thread, so is particularly important when thread was expensive. With this type of work the thread is laid on the surface and only pierces the fabric when it changes direction. With many stitches there is almost as much thread behind the fabric as on the visible surface. The implication is that the cost involved in creating thread made it an item that needed to be used economically. Anybody who has combed, picked and spun a strand of a prepared fleece, before winding several strands into a working thread, will recognise the need for economy. Economy might also account for the way opus anglicanum evolved. During the 11th century, it appears that it was normal to apply the designs over the cloth leaving extensive areas of the background cloth visible. 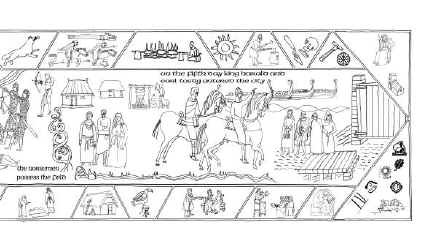 Over half of the background cloth is visible on the Bayeux Tapestry. However, opus anglicanum usually covered the whole of the cloth. Perhaps thread became gradually cheaper and a fully embroidered surface would have been suitable for special garments such as clerical vestments. One footnote about the workforce: it is generally agreed that it was the women who undertook the embroidery although there is little solid evidence for this. It is interesting to note that when opus anglicanum became a business, it employed men and women.